"Our choice for the best overall dry weight management cat food,with 30% protein and only 9% fat." "Made up of 30% protein and 9% crude fat, contains Glucosamine and Chondroitin to help slow joint destruction." "Made with whole wild salmon and whitefish, still very low in fat without the grains." "A boost of freeze-dried raw chicken makes this dry food more appetizing to finicky cats." "A great choice for a low-calorie wet cat food, with high levels of natural fiber." "Made with avocados, to promote a healthy coat in pets; top ingredients are chicken and rice." "Made only with 100% pure whitefish, incredibly low in fat and calories, and high in Omega-3 fatty acids." Wellness Complete has more fiber than typical cat food, while helps cats feel full faster and reduces overeating. Owners say Wellness not only helped cut down on excess weight in their cat, but some report that it helped with allergies as well. Since it doesn't contain fillers, it’s a great choice for cats with sensitive stomachs. Halo’s Healthy Weight food is a great compromise. Made with whole wild salmon and whitefish, it’s still very low in fat without the grains. It does have slightly more fat than other low-fat brands (12%), but it’s still a solid choice for your cat. Reviewers note that the food is a bit smelly (its number-one ingredient is fish, after all), but the odor is worth it for a high-quality, reduced calorie, grain-free cat food. Reviewers say that not only did their heavy cats shed weight on AvoDerm, but that they saw a marked reduction in hairballs almost immediately. 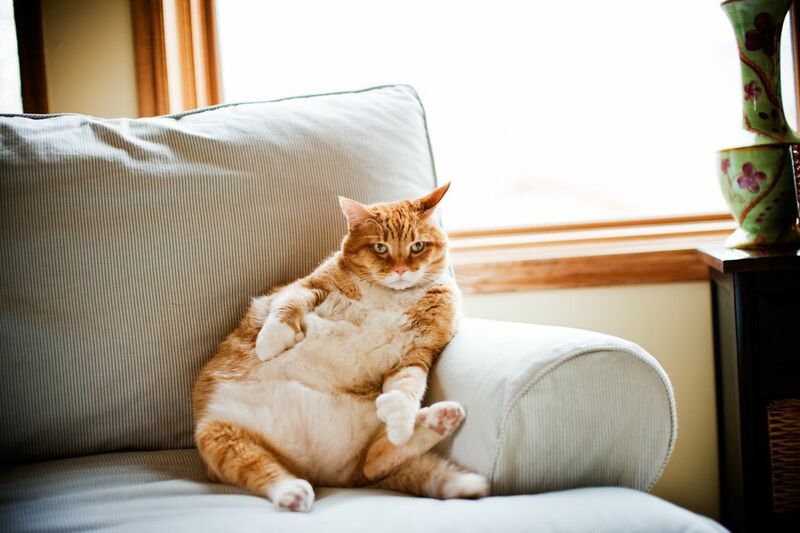 If your cat is prone to hairballs, AvoDerm is a great weight control food. Your couch and carpet can thank us later. Reviewers remark on the slightly pungent smell, but rave that their cats love the CodderTots treats. If your cat is on a low-calorie diet, a healthy, fat-free treat is a great way to reward him for good behavior while keeping his calories restricted.